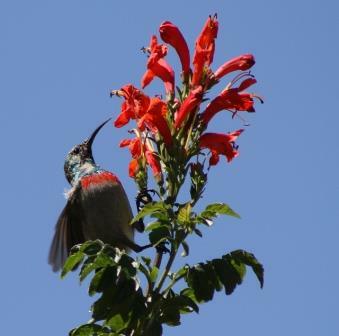 The Butterfly Bush will bloom almost continuously from spring to autumn. 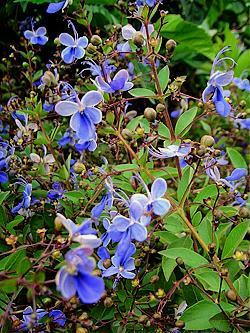 The butterfly bush is strikingly beautiful, and because blue remains the most rare and sought-after flower colour for gardens, this plant fits the bill perfectly with its heavenly blue to purple flowers which resemble fanciful butterflies, hence its common name "blue butterfly bush." The fluttering flower panicles sprout from the ends of long arching branches, and each flower has one violet-blue petal and four pale blue ones, framed by long purple anthers which bend elegantly upwards, hence its other common name "blue cat's whiskers". The plant will bloom almost continuously from spring to autumn, but typically flowers most heavily when the temperatures cool down in autumn. The flowers are a firm favourite with carpenter bees and lure butterflies with their nectar; and the showy, black fleshy fruits are devoured by birds and monkeys. 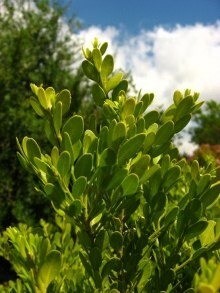 The Cape honeysuckle is water-wise and a ‘must-have’ for bird and butterfly gardens. This indigenous shrub remains wildly popular with gardeners in South Africa and around the world for its clusters of tubular flowers in brilliant shades of orange, red, yellow, apricot or salmon, thanks to modern garden hybrids. 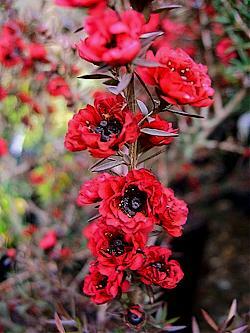 Flowering is sporadic throughout the year in warm regions, and these hybrids have even more blooming power, and the vibrancy of the flower colours is shown off perfectly by the plants dark green, glossy leaves. The flowers are followed by long, narrow seed pods which split open when ripe, to disperse the seeds.